With just a few days left before dads’ day, here are a few suggestions for wine books you can pick up at the local bookstore or order quickly off Amazon. Hugh Johnson’s Pocket Wine Book 2008 – This is a classic little volume perfect for sneaky glances while out at a restaurant where you need a reminder on the best years for a French Burgundy. It has seviceable wine pairing suggestions and even a primer on wine glass selection. At $14.95, this is a good bet. 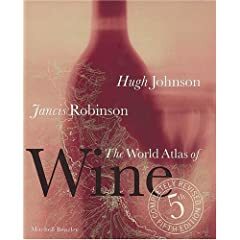 The World Atlas of Wine Hugh Johnson and Jancis Robinson – This is a good building block for a strong wine library, as are the following four books. Oz Clarke’s Grapes and Wines: The definitive guide to the world’s great grapes and the wines they make – $25 paperback. Also writes an annual pocket guide to wine like the Hugh Johnson book.